We are pleased to announce that you and your child can access award-winning Discovery Education Espresso service from home. We use Espresso in school to help motivate, engage and support learning in the classroom. Now your child can continue to enjoy what they have been doing at school, and you can be involved in their learning at home. 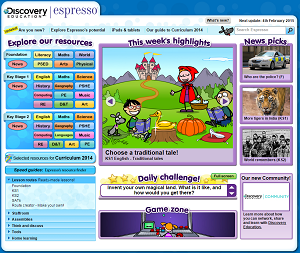 Espresso is an online cross-curricular service that provides video-rich resources to schools throughout the UK. It contains thousands of videos and multimedia activities, as well as a weekly news service — all designed by teaching professionals. To access Espresso from home please visit www.discoveryeducation.co.uk then click the ‘Login’ button in the top right corner, select ‘Discovery Education Espresso’ and enter your child’s username and password that was provided by the school. If your child does not have or has forgotten these details, please ask them to speak with their class teacher. Before you start using the service, we recommend you read the Parents’ guide. This explains what Discovery Education Espresso is, how to use it and how to support your child with their learning. To find the guide, select one of the Home learning icons (from the appropriate phase or key stage) on the left-hand side of the home page. The Parents’ guide button is located in the top left-hand corner of the following page. We hope you will find Discovery Education Espresso useful as a resource to extend your child’s learning. If you have any further questions about how to use the service, please speak to your child’s class teacher. We were delighted to welcome Mr Lewis Bronze, founder of Espresso to Whitchurch Primary School. Mr Bronze enjoyed a tour of our school, spoke with pupils and staff and answered questions from senior pupils regarding his journey as an entrepreneur. Thank you for visiting our school! Diolch yn fawr.